Las nuevas tecnologías y la creciente demanda del internet, resultan un campo fértil para la delincuencia, que ha encontrado nuevas formas para consumar delitos a través de medios electrónicos y tecnológicos, los cuales son aprovechados para afectar a la ciudadanía, las empresas y el gobierno. New technologies and the growing demand for Internet have become fertile grounds for criminality, having uncovered new ways to commit criminal acts through electronic and technological means, which are leveraged to impact citizens, businesses, and the government. The initiative that Fayad presented, the Federal Law to Prevent and Punish Cybercrimes, defined concepts such as “cyber weapons” and “cyberterrorism” and established special criminal categories such as “sexual predation”, “identity theft” and “cyber attacks” among others. The bill defined “cyber weapons” as any software, computer system, device or material created or designed for the purpose of committing one of the cybercrimes identified in the draft. In the case of “cyberterrorism,” one category according to Fayad's proposal treated any training or recruiting activities as terrorist activity. Another category included anything affecting Mexico's cyber infrastructure. The legislation also sought to delineate different criminal offenses in terms of privacy and the protection of personal information, though the existing Federal Law on Protection of Personal Data Held by Private Individuals already safeguards these protections. On November 3, Omar Fayad informed the Chairman of the Board of the Mexican Senate of his decision to withdraw the initiative, as reported by SinEmbargo and other sources. La iniciativa de Ley Federal para Prevenir y Sancionar Delitos Informáticos presentada por el senador Omar Fayad el martes 27 de octubre, supone graves riesgos para las libertades en internet de los ciudadanos mexicanos. La iniciativa, redactada de la mano de la Policía Federal, atenta contra los derechos a la libertad de expresión, privacidad y acceso a la información. Además, propone sancionar con cárcel actividades legítimas en internet e incrementa las capacidades de vigilancia de los cuerpos policiales. En cuanto al derecho a la privacidad, los artículos 11 y 12 obligan a cualquier empresa de telecomunicaciones (Telmex, Movistar, AT&T) y a cualquier proveedor de servicios en Internet (Google, Facebook, Twitter, Uber) a entregar a la policía la información y geolocalización de sus usuarios. No se requiere autorización judicial y no hay salvaguardas para el abuso. The proposal of the Federal Law to Prevent and Punish Cybercrimes presented by Senator Omar Fayad on Tuesday, October 27, poses serious risks to Mexican citizens’ Internet freedoms. The bill, drafted with the hand of the Federal Police, violates the rights to freedom of expression, privacy, and access to information. Besides that, it proposes incarceration as punishment for legitimate Internet activities and it increases the surveillance capabilities of police forces. With respect to the right to privacy, Articles 11 and 12 require any telecommunications company (Telmex, Movistar, AT&T) and any online services provider (Google, Facebook, Twitter, Uber) to submit to police the data and geotracking of their users. No judicial authorization is required and there are no safeguards against abuse. El proyecto contempla delitos que ya existen en otras leyes, como el terrorismo informático y el ciberespionaje, pero en la iniciativa se definen en términos demasiado ambiguos, abriendo la puerta a áreas grises y abusos. The draft considers criminal acts that are already covered in other laws, such as cyberterrorism and cyber espionage, but the bill defines them in overly ambiguous terms, opening the door for grey areas and abuses. Hace unos días, el senador priista Omar Fayad lanzó una propuesta de ley que, aparentemente, busca combatir y sancionar los delitos informáticos. Esta ley, sin embargo, está plagada de errores de redacción y ambigüedades que hacen que uno pueda ser sancionado prácticamente por hacer uso de una computadora, prohibir hablar mal de cualquier político, entre otras cosas. Por supuesto, solo era cuestión de tiempo para que Anonymous respondiera a esta ley y lo hicieron, muy a su estilo, con un video de denuncia. A few days ago, PRI party Senator Omar Fayad launched a legislative bill that apparently seeks to combat and punish cybercrimes. This law, however, is plagued with redaction errors and ambiguities that make it so that anyone can be punished for basically using a computer, and prohibits badmouthing any politician, among other things. Of course, it was only a matter of time for Anonymous to respond to this law, and they did it very much in their style, with a video denouncing the bill. Su despropósito es que en su redacción deficiente confunde libertades -como la crítica o la difusión de información de interés público, cuando se trata de personajes de la vida pública o servidores públicos- con “ataques” y “acosos” o “divulgación de información de carácter personal”, que aparecen como conductas delictivas penadas. The nonsense is in how this deficient draft confuses freedoms—such as criticism or dissemination of information in the public interest, when it concerns public figures or public servants—with “attacks” and “harassment” or “disclosure of personal information,” that become punishable as criminal conduct. It is noteworthy that the agency tasked with enforcing for privacy rights in Mexico did not make any declaration about Omar Fayad's proposal, which could just as well be raised again by him or by one of his colleagues. It is worth noting that Fayad is not the first Mexican public servant to bring an issue like this to the public agenda. In the past, the legislator Federico Döring promoted regulations in Mexico similar to the Stop Online Privacy Act (SOPA) in the United States. The governor of Veracruz, Javier Duarte (rising from the ranks of the PRI, just like Fayad) promoted reforms to local penal code that would have criminalized the disclosure of information on social networks. The so-called “Duarte Law” was later declared unconstitutional by the judicial branch of the Mexican government. These ranges for prison sentences are particularly strange, considering that public servants convicted of significantly more serious offenses (like illegally concealing information) face imprisonment for just 2-7 years. Other crimes committed “off-network” (for example, operating a business with a forged license) risks just 1-6 years in prison. Déficit's mention of the Democratic Revolutionary Party (PRD) refers to the mayor-and-wife team in Iguala, Guerrero (known as the “Imperial Couple“), and the mayor of Cocula, Guerrero. These individuals have been linked to organized crime and are alleged to have born some responsibility for the Iguala Ayotzinapa massacre of 43 students in 2014. Several other individuals from the PRD are also believed to be associated with organized crime. 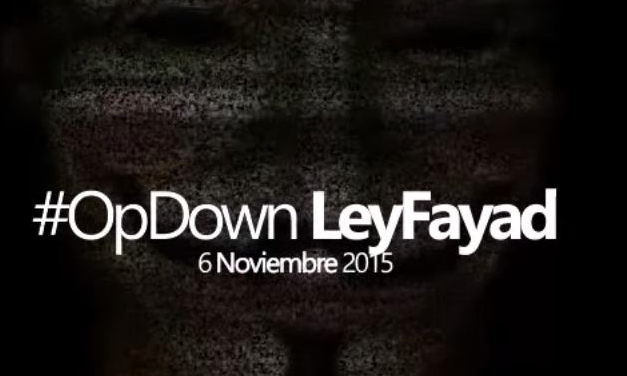 Dice @omarfayad que la #leyfayad no tiene ninguna falla pero que la va a retirar. Con ese nivel de autocrítica es difícil mejorar. @omarfayad says that the #leyfayad has no flaws but he's going to withdraw it. With a level of self-criticism like his, it's hard to improve. With these open threats to citizens’ freedoms of speech, privacy, and digital rights, Mexico’s political elites are showing signs of reasserting — or maybe even seeking to reaffirm — the distinct brand of authoritarianism that long characterized their leadership.